So I know it’s been over a month since I’ve posted – but now that i’m feeling more settled I can give a much better report on life at the Architecture School in Ferrara. I’m taking classes in first and second year, but have friends in 3rd and 4th so I’m starting to get the full picture and understand exactly what the typical Italian Architecture program is like. My first year class is a drawing/design studio – called “corso integrato di disegno” which is very very basic, but provides some interesting starting points for students who haven’t taken that many arch classes before. It’s broken up into 3 components, history, geometry and lab – some of which are significantly more enjoyable than others. History is on average a 2 hour segment once a week that goes over drawing basics, the history of the art form and famous architects who’ve contributed something significant to the movement. Geometry is less interesting and seems to be the least favorite part for all of the 130 students. It started out with sacred geometry problems, like proportions of cloisters and the significance of the golden ratio – but has since moved to mathematical projections of objects in various ways. It’s interesting, but not terribly easy to understand in italian. Also on average a 2 hour segment once a week. The third piece at 4 hours once a week is lab. So far we have been drawing outside in the piazza and working to redraw the plans for Mies Van der Rohe’s famous Farnsworth house. Lab should be the most time consuming, but also teach the most valuable lessons about drawing plans, sections, elevations and perspective renderings. Its all done by hand – and some without a ruler – but it’s good eye training and the class, like I said, teaches some really valuable lessons for those people who’ve never done this. In all honesty I wish I’d taken a more advanced class (having done most of these exercises in the past) but acknowledge that it is good practice at least. It’s also good to be in class with freshman, who are eager to make friends and meet everyone. Much friendlier at the beginning than other older students who’ve made close friends in past years. My second year class is “urbanistica” which basically goes over the history of the evolution of cities. It’s absolutely wonderful – and by far my favorite class here. It’s a long loooong time to sit still (as it’s two 4 hour lectures per week) but we always get a 10, no 15, no 30 minute coffee and cigarette break at some point during the 4 hours. 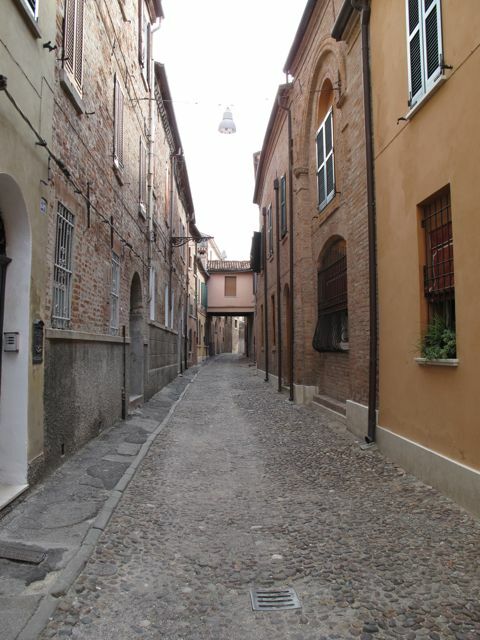 Classes are usually based around a theme (like post WWII reconstruction) or dedicated entirely to one or two cities – the best of these being Ferrara. It was absolutely wonderful to sit and learn about Ferrara from the late 600s until today and then step outside and walk past all of the same monuments. The prof is really passionate and very very accepting of foreign students – of which there are many in the class. He also invites tons of guest lecturers to speak, giving a new perspective (and often a new dialect). Coursework consists of a semester long project in groups (everything is in groups) in which we study the evolution of a nearby city and produce a book explaining it. There is also ONE oral exam at the end of the semester (in january really) that relies on knowing the material of 3 books really really well. The books are fascinating, but reading in italian takes a little more effort. Yeah.. Overall – I’ve had some hard weeks and some wonderful ones. Some classes are awful some are wonderful – but in general I am really glad to be here. The program is huge, and wont coddle you the way american ones might, but the information and point of view is unique and certainly worth hearing. I’ve made friends with tons and tones of italians, and exchange (erasmus) students. Generally the exchange students will be great friends to have because they too are going to the same difficulty with comprehension and also know very very few people. The italians are more cliquey but all thing its the coolest thing that you come from the states and chose to come here – to Ferrara – really!? I’m going to leave you all with some nice pictures of the architecture school and the medieval wall around the city. The first (above) is taken from the top of the wall looking back at the building, and the second is the opposite direction looking out over the grassy field and the bike path. The facoltà is really fortunate to be situated where it is in such a picturesque spot!! As happens with all blogs that I involve myself with, I fall behind… way behind. So although I started writing this quite a while ago (september 16th they tell me), I will finally finish it now. It was my first week of real class. I had more or less made some course choices (mostly around scheduling availabilities) and found myself in a more comfortable situation after a LONG day of studio (9am-6:30pm no joke): the dark lecture hall. The course was “Methodologie des Structures” (same in English) and was set up like an architectural history class ‘cept it was all about the engineering side of things. At this point, I’ve actually already finished the course and taken the final (more on that later). 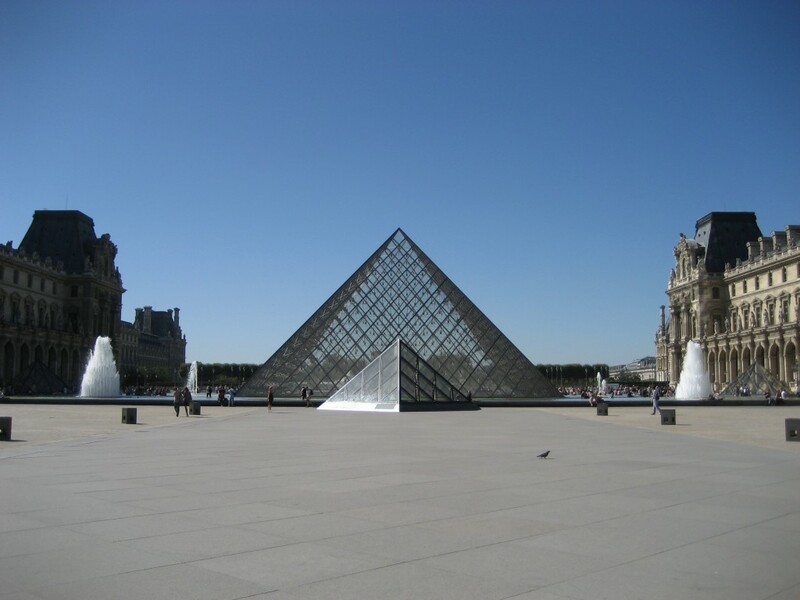 In his opening spiel however, my professor started describing a project he had worked on when he was just starting out as an engineer, you know, something small, unheard of… like I.M Pei’s addition to the Louvre. I think I can pretty safely say that most professionals in the field of architecture would agree that Mr. Pei’s intervention was successful. At the very least, I’ll put my neck out there and say that it rocks. Anyway, I was entranced with his description of the structural system that held together the delicate pyramids of glass. The smaller inverted pyramid proved to be the most interesting, and apparently is even an example of failed maintenance despite it’s distinguished status. The best came after class though. Tired from a long 12 hour day of courses, I got on my bus, Bus 68 that quite conveniently goes from right in front of ESA to a couple hundred meters away from my apartment, and began my pleasant, yet lengthy, journey home. About halfway back, having just crossed the Seine, I found myself a pane of glass away from 673 very famous panes of glass. The glass pyramids that had just dazzled me from the projector were right in front of my very eyes. Writing this now, after having become a little more accustomed to the splendors of Paris (and the route of Bus 68) it seems almost silly, but I was bewitched that night. They shimmered and sparkled in the fading light, an unearthly sight. The next day I decided to take my time and walked home following bus 68’s route, through the Latin quarter, across le Pont des Arts (a ped bridge, the bus crosses either Carrousel or Royal), through the Louvre courtyards (where I snapped the above photo) and back up l’Avenue de l’Opera past Garnier’s masterpiece to home. I won’t lie to you and say that Paris is a perfect city or that my time here has been spent primarily sitting in cafes sipping cafe and looking fabulous, but I will say that it does have a little ‘je ne sais quoi’. Also, although not surprisingly, it’s an excellent city for studying architecture, historic and contemporary. It’s hard to complain when you see all these masterpieces on the bus ride home. 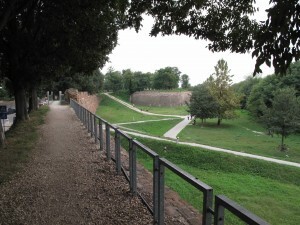 So I arrived in Ferrara about two weeks ago and have been slowly exploring the city. I’m living with 3 italian students – one from Sicily, one from Puglia and ove from Venice – in a wonderful but small house right in the center of the city. (i’m attaching a picture of the narrow street i live off of) The city is small for a “city” but is full of students and feels almost like a college town. There is a beautiful castle (complete with moat) and a brilliant white cathedral right in the center of the city. The piazza between the two is always full of people and very lively until 3 am most nights. Also, becuase Ferrara is relatively small (130,000 people) and doesn’t have the fame of Rome, Venice or Florence there aren’t as many tourists or English speakers. This makes for a much more beneficial environment in which to learn Italian and actually feel integrated into he community. 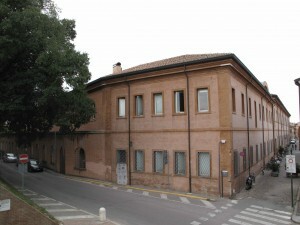 As far as the architecture program – the building is an old palace that was converted into this school. 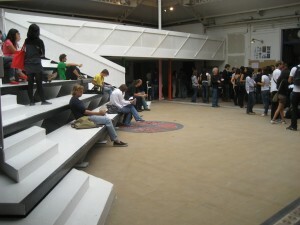 It has huge rooms and windows, and is a really inspiring space to be in. As far as work, I’m still really unsure about what courses I am taking as the responsability for selection is all on the shoulders of the Middlebury student. Italian students at the school have fixed courses for 4 of their 5 years, but middlebury students are essentially given the option of picking any available single class in the first 3 (or 5 if you ask reeeallly nicely) years. This is a really daunting task. Today i went to the first year design studio to see what it was like. It is actually composed of two classes, one traditional studio much like middlebury’s intro or intermediate studio, and one geometry class. There seems to be a huge focus on geometry, partially to give a better understanding of early italian architecture (churches, monasteries etc.) and why certain shapes appear more often than others. We’ll see how it unfolds. Tomorrow i am going to go to a 2nd year studio as a point of comparison, and thursday i’m planning on going to an upper level urbanism class. The program seems structured to the point that it might be worth just starting at the beginning, so that as the second semester approaches (at least for students staying the year) you will be completely prepared. I think second semester of freshman year is very very CAD intensive and most upper lever classes depend on that – but i’ll know more by the end of the week. Middlebury also has a required language/literature class for all Middlebury students in Ferrara. So far it has been somewhat interesting as we are reading works about Ferrara or by authors who lived here. 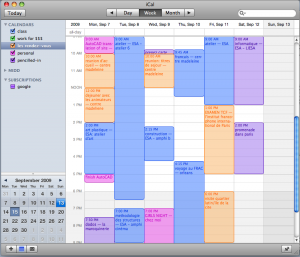 It is looking like it will be in conflict with whatever classes i take at the architecture school (because they meet from 9am until 6 or 8pm on some days) but all of the professors seem understanding – so i’ll keep you posted about flexibility in scheduling as i learn more about arch classes. I’m going to return to class picking.. drawing.. and italian poetry for the night, but i’ll keep you updated as the week unfolds. At ESA you don’t get to choose any of our courses until your 3rd or 4th year. Even then, the choice is mostly between studios (i.e. which professor you prefer) and maybe an either/or elective option. Since I was place with the 3rd semester/2nd year students, however, there are no alternatives. I’m not, however, taking the full load of courses which means that apart from the studio I get to pick and choose what I take. I chose to take the art class, and two more engineering based courses: “Methodology of Structures” and “Construction”. Surprisingly, there isn’t much overlap between the two. My reasoning was that art would be fun and that the two structures classes weren’t available to me at Middlebury. A year abroad is supposed to be different, right? The other options were a “Descriptive Geometry” course, an art history, an architecture history (they said the teacher was awful, otherwise…), “Methodology of the Project” and of course, English. There is also a computer class where we learn all the fancy architectural software programs. It meets on Saturday mornings (I know!) and although I’m not taking it for credit, I have been making it to school and following it since I so desperately need to be caught up to speed with all the fancy computer stuff we do here. that there some classes that are painfully boring (so I hear), others that are unnecessarily hard (also hearsay) and still more that offer pretty much the same thing that I could get at middlebury (art history for example). The disadvantage is that I continue to be the ‘cas spéciale’ [read: outlier]. I’ve been getting a lot of “why weren’t you in class this morning?” from other students and while this is a helpful conversation starter as I slowly try to make the ever-elusive “real french friend” that they told me about in orientation, I always feel bad when I explain that I’m mostly just taking what I want. so… i started writing this post a looong time ago, and while it’s been sitting on the to-do list for quite some time, the crunch of still getting used to it all and piling schoolwork on top of it has been a lot. so what i’m going to do is get you up to speed with a spurt of short posts over the next couple days. the good news is that since you’re hearing about the trying first weeks as i reflect back on them instead of as i live them, you’ll be subjected to less b*tching and moaning. 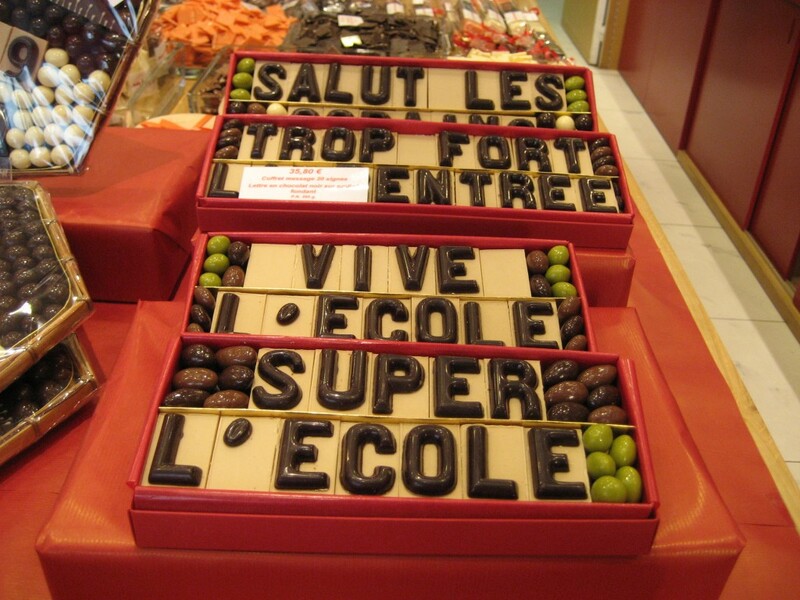 we give apples, the French give CHOCOLATE! Since my plane landed at Charles de Gaulle last Monday, I’ve been keeping pretty busy as I try to adjust to a new life and get all the important details sorted out. The day after I landed, on Tuesday, I had an appointment at ESA to sort out the last things officially. I didn’t really know what to expect (and to be honest was expecting the worst where they would take one look at my portfolio and send me out the door) but luckily it ended up just being a pretty short meeting with Marie-Helene, the international student coordinator, and Marie-Helene, the dean of sorts, to place me into semester three. That means that I will be with students in their second year of school who have taken two studio courses in two semesters, which seems to correspond well to the two studios (130 Intro & 330 Intermediate) at Middlebury. The next day was a short orientation for “Exchange Students” that was really more confusing than helpful. The reason is that as a Middlebury student at ESA, I am NOT an exchange student. Those kids are from Architecture schools around the globe that have partnered with ESA to, well, exchange students. Also, these students are typically in year three or four (or five) of their architectural education which means they are all placed in semesters 5, 6, 7… you get the picture. Thursday was “la rentrée” for ESA (aka first day of school), which here in France seems to be quite a big deal for some reason (see above). When I showed up to school that day in a simple skinny jeans/t-shirt combination, I was a little embarrassed since most people seemed to be dressed up. Of course I had worn dresses the two previous days… For me, this day was my first sneak peak into real French Scholastic Culture. Needless to say, I was mildly horrified. As administrators and professors explained seemingly important information to a few-hundred students, there were at least 100 separate conversations in the room. When the noise got to the point where you could no longer decipher the words being spoken into the microphone, they would sternly demand silence and the relative quiet would last for most of five seconds. In the end, I figured that I shouldn’t be too concerned with missing some information since no one else was hearing it either and what I did hear (exciting lectures, a week of a school-wide workshop, study tours…) seemed pretty fabulous. I suppose a short explanation is in order. While this blog may serve several purposes, it has one simple subject; it is the record of Middlebury students spending their junior year abroad at architectural school. I have recently arrived in Paris where I am attending l’École Spéciale d’Architecture and Jesse will soon be heading over to Ferrara, Italy to attend the well-known architecture school at the University of Ferrara. We have both signed up for a full year of work/fun and are feeling excited/anxious about what lies ahead. We hope that this blog will be helpful to any students considering studying abroad with architecture and for everyone else, that it at least provides a little entertainment.